Add modern, contemporary style to a basic household essential. Made of natural treated wood curved into a waste can shape, Woodrow warms and grounds a room, even though its core function is being a trash can. Use Woodrow to add a modern, subtle decorative touch to your powder room, bathroom, office, study or wherever you choose to put it. 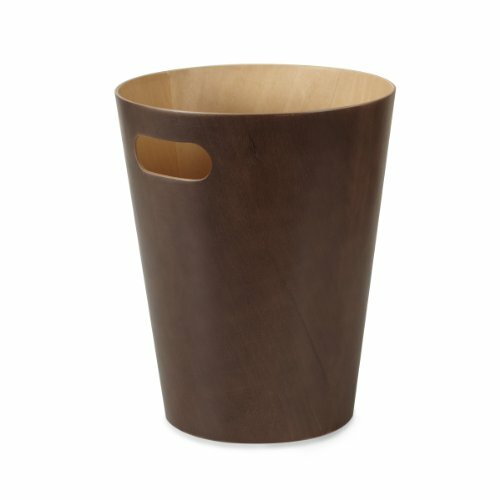 This two-tone waste can fills any room with modern contemporary aesthetic and makes a great home office wastebasket or office recycling container. Woodrow is available in a wide range of finishes, all come with a natural wood finish on the interior. It features integrated handles that allow for easy transport and disposal of waste or recycling. Woodrow measures 9” diameter x 11” tall and has a capacity of 2 gallons (7.5 L), which is great for small spaces. DESIGNED BY HENRY HUANG FOR UMBRA: "When redecorating my home, I was looking for a very clean and simple waste bin in real materials that would coordinate with the rest of my furniture. I designed the Woodrow waste can in a natural material that not only provided an elegant look but in a form not typically seen"